Last week a friend and I decided to spend an afternoon on an elaborate obstacle course suspended by ropes and cables from trees. We shimmied across platforms circling tree trunks, balanced on suspended logs, climbed a cargo net, and slid across several zip lines. The physical actions required to complete the course reminded me of the platforming and set pieces of the Uncharted games and the Tomb Raider reboot. After finishing the Tomb Raider reboot last month, I thought that those sections failed to provide tension despite entire architectures crumbling and rock structures caving in all around Lara. Escaping from a burning monastery just felt like going through the motions to me. But walking along the tightrope on the course with ropes to hold on to and harnesses hooked to a safety cable felt pretty scary. Obviously, a physical simulation of traversing a dangerous environment is going to be more frightening than a virtual simulation in which you sit on the couch with a controller in your hand. But I think my experience on the course reveals how these games try to compensate for the mundane safety of your own body by putting your virtual body in spectacular danger. Sadly, this contextual approach of raising the stakes to create tension doesn’t always work because harnesses more foolproof than those of the obstacle course are baked into these games’ design. I think Uncharted 2 was my first photorealistic AAA action game, and I was very impressed by this scene and all the other climby bits back in 2009--the bombast of the visuals, the way the ledges and platforms crumble and disappear the moment you jump to the next, and Drake’s great animations and weighty kinaesthetics. But after playing both Among Thieves and Drake’s Fortune a few times, the illusion started to break as I became more aware of the harnesses. By the time I played Uncharted 3, these set pieces still looked remarkable, but they didn’t really offer any surprises or true moments of tension. I realized that every climbable ledge stands out in the environments because of its shading, there will always be a climbable ledge when Drake is in danger, and Drake can safely stand still in a burning ruin forever or hold on to a ledge without getting tired. Drake will always survive these perilous platforming sections because 1) such a death would be “anti-climatic” by these games’ standards and 2) game narratives built around controlling a singular protagonist can’t really afford their deaths. Drake will leap across impossibly wide chasms, as the game wills it. If Drake jumps on a platform that breaks, Elena will save him just in time, as the game wills it. If you, the player, mess up and deviate from the game’s script, and Drake plummets down a bottomless pit, the invisible harness will catch him, respawning him just a few seconds before the failed leap. You come to realize that not only is your own body always safe when playing Uncharted, but Drake’s body is ultimately safe too. The physical strength and dexterity required of the difficult parts of the obstacle course are in and of themselves the course’s source of fun and engagement. But in the games all you have to do is move the stick in certain directions and press X at the right time or perform a simple quick-time event. To make platforming sections feel more like rewarding labor, the games emphasize the hazards, make the jumps wider and the stakes higher. While the obstacle course designers want to make their users feel safe, the game designers want to make their players feel in peril, and both sometimes fail. My friend was too scared of heights and too short to easily reach the wire to slow down when on the zip line. The platforming set pieces of Uncharted and Tomb Raider, with their toothless threats to your character’s safety, are often no more exciting than your local playground and jungle gym. I think these action games are starting to realize that these set pieces aren’t very affecting. The Last of Us replaces most platforming with the frankly quite worse ladder puzzles, and Tomb Raider tries to go beyond Uncharted by forcing the player to watch needlessly gritty, horrible cutscenes of Lara’s death, often by impalement, perhaps to make players feel more pressure to perform well so as to not have to see such obnoxious, gross images. There is one sequence in Tomb Raider, however, that is fairly successful: when Lara climbs the radio tower. The scene requires the simplest interaction of all the set pieces--holding up to climb the ladder. But in context, this scene is essential to Lara’s character progression. Everything relies on this moment. Successfully climbing the rusty, extremely tall, and partially broken tower in the chilling wind not only means that Lara and her friends might be able to signal for help and safely get off the island but also that Lara can start to believe that she is capable of overcoming incredible odds in order to survive the toughest scenarios. The way the wind whistles ominously and the camera pulls away from Lara and back towards her suggests that this is a pivotal moment and that tragedy could strike at any point during Lara’s climb. Her palpable trepidation as she ascends the tower and her immense relief as someone responds to her distress signal at the top make for an tense, emotionally powerful moment. 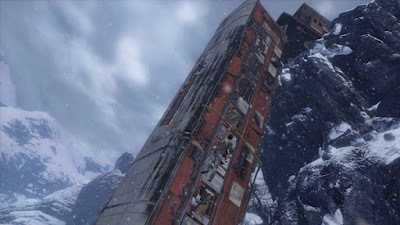 This scene in Tomb Raider is successful mostly because the action of climbing becomes significant to the character and the narrative context, which these set pieces rarely are. Platforming seems to be used primarily as a device for pacing. We scale a fortress wall to give us break from shooting dudes in the face. And that works for the most part; those sections lack the stress of combat, even though they should probably include the stress of physical exertion on our character. But Lara will never tire out climbing up a rope that she used as a zip line like I almost did on the course when I took the wrong zip and had to turn back. She’ll use a single climbing axe to scale rock walls (I’m not sure how that’s even possible), but there are no contingencies in which she slips or the axe falls out. These gameplay sections that would be incredibly difficult and petrifying to perform in real life are usually taken as a breather. I don’t really have a solution to the problems of the platforming bits in Uncharted and Tomb Raider and other action games. Besides, they do work well to control the games’ pacing, and it can be fun to perform the acrobatics amidst the spectacle of things exploding, collapsing, burning down, etc. Despite their benefits to the games’ structures and how they always look incredible, they often don’t evoke much of anything and appear little more than excessive showcases of technology. I realize it’s not really news to anybody that an aspect of Uncharted has become rote and that the main purpose of whole parts of games is simply to mix things up for the player or show off a game’s engine. I just want to suggest that climbing, shimmying, balancing, and zipping could be actions that excite and engage players and provide a challenge that’s meaningful to the characters that players control. How, exactly? I don’t think I can fumble through armchair game design advice on this topic, but perhaps the radio tower scene from Tomb Raider is a start. Ultimately, though, I can only leave you hanging (sorry) with these observations.